ATLANTA, GEORGIA, March 20, 2018 — Passengers traveling through Dallas Fort Worth’s Terminal D get a taste of the future of retail thanks to a major expansion and high-tech redesign of the terminal’s Duty Free Center shop. 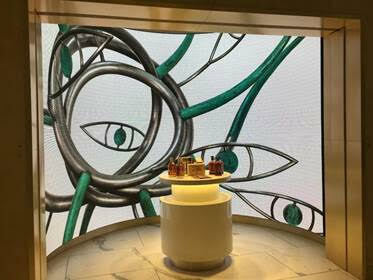 Occupying a space of more than two gate holding areas, or roughly one-fourth of the total floor space at Terminal D, the new Duty Free shop is more like a mini high-end mall than an airport store. High-tech additions, installed by Ford AV, are key for maintaining a luxury shopping experience. 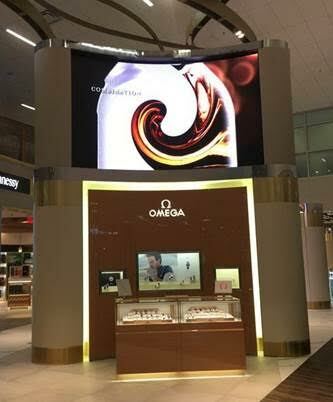 The most striking and obvious installs include three huge, curved NanoLumens® LED displays that allow advertisers to capture the attention of all who walk by. NanoLumens, headquartered in Atlanta, Georgia, creates display visualization solutions that deliver truly immersive customer experiences and great return on investment. We provide unique solutions to problems that haven’t been thought of yet. Our fully custom display solutions provide engaging customer experiences and the ability to realize solid returns on investment. Our brilliant displays, designed and assembled in the USA, are so thin, lightweight and curvable, they fit almost anywhere. With quality backed by an industry leading, Six Year Warranty, NanoLumens is your collaboration partner for visualization solutions that live up to your imagination. For more information, visit www.nanolumens.com.